Plot The Course continued on his winning way with another impressive win in the final race on Bendigo Cup day over 1600m. 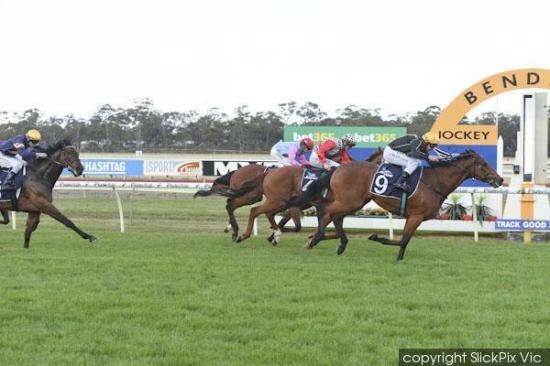 Given no favours in the run from the wide draw Mark Pegus navigated the best possible course despite early interference and the need to be up in the first 4 or 5 horses later in the day. He speared him into 5th/6th 3 deep with cover and gave him clear air on straightening. Plot The Course took most of the straight to get past the 2 placegetters who enjoyed a much softer run in transit. He started to draw away over the final 50metres for a very tough win. The lighly raced 4 year old was the least experience horse in the field and now boasts an impressive 6 starts for 3 wins and 2 minor placings. Provided he pulls up well a start on Oaks Day beckons in a very suitable restricted 1800m race. Congratulations to all involved on the win.